The Yasuni National Park is Ecuador’s largest (www.liveyasuni.org). Native peoples have lived in the area that is now a natural preserve, as well as around it, for thousands of years. Their history stems from before the days of the arrival of the Spanish Conquistadors, but it hasn’t been written. Nor can many artifacts be found that register a clear sign of their settlement in the area. In part, this is due to the fact that they are semi-nomadic, that is, their culture has for eons been nomadic in nature, settling in general locations according to the fruits and products of seasons. Their settling a particular place was never long enough for a need to erect durable structures, nor were their artifacts made of materials that could survive the passing of time. Therefore, hardly any remains have been found by archeologists, not that many have actually dared to venture into the heart of the jungle. The cultures of the Amazon basin have been so much part of their environment, that their passing through it can be compared to the falling of leaves shed by trees, the memories of days gone almost as short-lived as the recalling of names from generations past. While the Spanish priests did their part in subduing the wild hordes of natives in order to bring them into the productive cycle of western society through their work in farms and missions, the rubber-harvesters from the east fostered in them an antagonistic attitude against the invaders by treating the native people in ways that, nowadays, make us wonder who the real savages have been all along. The Napo Runas —the people of the Napo River—, are an indistinct mix of various native peoples who escaped up-river from the tyranny of the rubber-harvesters. Their jungle culture mixed itself with Andean people of the Quichua group, so their language today is the so-called Lower Quichua, and they are called either Naporunas or Quichuas. They inhabit the shores along the Napo River and its tributaries up the slopes of the Andes, as well as along the rivers Aguarico, San Miguel and Putumayo. It is calculated that they are currently around 60.000 strong and growing. As they have been westernized the most, many having lost a fair grasp of their original culture, which was a fusion of various indigenous roots anyway and perhaps not so strongly embedded as the customs of other native groups. Other Quichua groups have formed south to the rivers Pastaza, Curaray and Bonbonaza, where they have fought hard to get rid of the invasive oil companies. As they have been all around the territory of the Huaorani (Waorani), accounts of their fights go back many years, perhaps even centuries, so the oil companies, when they wanted to secure new territories, have offered the Quichuas land in the areas where they knew they would have to deal with Waorani resistance to their presence. This practice of offering land to “civilized natives” in territories selected by oil companies where they want to start drilling for oil, land protected by the Waorani, has been one of the main causes for bloodshed in the last decades. The Sionas, in the north-eastern region of Ecuador’s rainforest, live in the high grounds of the Aguarico River, 51 families in all, with less than 200 individuals that speak a mix of Paicoca and Spanish. Hunters and fishers, their activities have switched in part to tourism, all three types of livelihood being affected by crude-oil contamination and logging. The Secoyas are very much like the Sionas and share a similar territory as well as the same language. With just under 350 members left, which are part of 78 families, their main activities are agriculture, fishing and hunting, but as they are closer to the incursion of civilization, they are more directly affected by the oil companies, the African Palm plantations, both activities being highly detrimental to the environment and causing the entry of settlers from other parts of Ecuador. The Cofanes live like the Sionas and Secoyas close to the border with Colombia, north of the Yasuni. A bit more diverse in their economic activities, as they not only engage in the usual hunting and fishing, they are known to plant coffee and cotton, as well as produce fine ceramic artifacts with their very particular designs. There are only just over 350 members of this group, which was greatly affected by the Texaco oil spills over a period of 30 years. South of the Yasuni live the Zaparos, which have mostly disappeared. In 1991 a census counted 24 members, who lived along the shores of the Conambo, Pindoyacu and Curaray rivers. Their language, Zapara, is quickly being lost, as they mingle with the Spanish-speaking settlers. Even though the Shuar and Achuar do not stem from the Yasuni or its close surroundings, some Shuar families have moved closer due to the expansion of the oil companies, being offered resettlements (as have been given to Napo Runas) in territories originally held by the Huaorani. The Shuar, over 110 thousand strong, were known for centuries as the “headhunters of the Amazon.” They live south of the Yasuni region, and their ancestral rivalry with the Huaorani has been exploited to create armed struggles that then force the government to intervene with their military, thus expanding the “oil frontier” further into the jungle. The word “waorani” means “human being”. The Waorani have been the ancestral defenders of the region between the Napo River in the north, and the Curaray in the south. 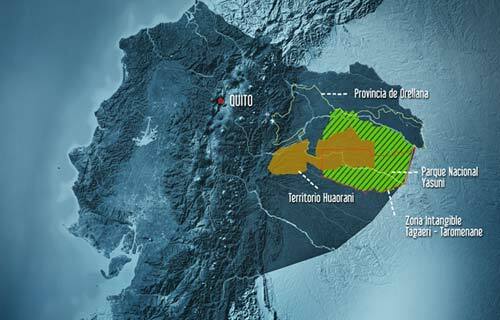 This area encompasses not only the Yasuni National Park, but also the Waorani Territory, and the Intangible Zone. For generations they were considered not only the most feared native people in the region, but also some of the most misunderstood. Their contact with the outside world did not begin until 1958, except through their acts of warfare in defense of their ancestral territory, which is much larger (2 million hectares) than the currently assigned Waorani Territory. As hunter-gatherers, the Waorani were nomads who change abodes according to the availability of food in different regions of the jungle defined by the seasons. The season of palm hearts, the season of fat monkeys, and so forth, so in order for their culture to survive they need large expanses of land. The US based Summer Linguistic’s Institute Evangelical Christians proposed the creation of the Waorani “reservation” in 1983, which cut their ancestral hunting grounds down to a “legal” 612.000 hectares. The ownership of the Waorani Territory was made official in 1990, with a stipulation that the Waorani may own the land, but they don’t own what’s under the surface, thus giving the government of Ecuador the chance to assign concessions to oil companies. The story of the Waorani warriors is a sad story that continues even today, though perhaps not as openly violent as in the beginning of the expansion of the oil frontier. Now the takeover is much more “civilized,” basically making them fully dependent on oil company support, mostly food, transportation, and other “socially responsible” provisions such as health centers, schools, and money. The dynamics have basically created two distinct factions among the Waorani, those aligned with the oil companies and the legally recognized governmental organizations, and those who live deeper in the jungle and look upon these structures as foreign and destructive of their ways. The moment a school is placed close to a settlement, it becomes permanent and they loose their nomadic ways. Similarly, the moment a health center is supplied to them, they forget about the plants which have for hundreds of years been their only source of medicine. With money comes the practice of hunting or gathering more than is needed at any given time, so instead of one monkey they now can kill ten, one for eating and nine for selling. In this way, the natural equilibrium, which they managed to sustain over generations can quickly be destroyed within one generation, leaving nothing of the jungle for generations to come. There seems to be some confusion regarding this term. “People in voluntary isolation” has an air of arrogance as well as an underlying sense of misunderstanding of who and what they are. It is clear that they have not isolated themselves from Nature, but rather from a society that has only shown disrespect for their ways. The term gets interchanged with Non-Contacted People, even though it does not mean the same. The families in so-called “voluntary isolation” are the Waorani followers of Taga. So, the Tagaeri are “the people of Taga,” and they retreated, in the 60’s, into what is today known as The Intangible Zone, when Texaco and general oil company activities drove them deeper into the jungle. Taga didn’t want to have any part in dealing with the “kuguris” —the invaders—, as other families did. This was the beginning of the “voluntary isolation” for the Tagaeri. The Taromenani and the Oñamenani are not directly Waorani, that is, they are not related to the Waorani as are the Tagaeri, though perhaps in a distant past there may have been some connection. Nevertheless, this may not necessarily be the case, as some oral lore tells of the Waorani having moved up from the lower Amazon basin to escape the attacks of cannibal tribes, which the Waorani never were, in spite of false claims of that nature. The fact is that both the Taromenani and the Oñamenani are native people who have not been contacted by civilization. In the case of the Oñamenani, it isn’t even clear if there are any left or if they have ceased to exist altogether, as occurred with the Tetetes and Zanzaguaris.